Normal pumpkins really aren't that scary. We'd actually go so far as to say they are friendly. Just think about it! They're a warm orange color, they're tasty when made into a pie and they just sit there, adding a little color to your decor. Of course, we can't speak for all pumpkins. For instance, that's not the kind of squash this mask is. This is the creepy kind that you might see sneaking it's way into your nightmares on top of the head of a headless horseman. 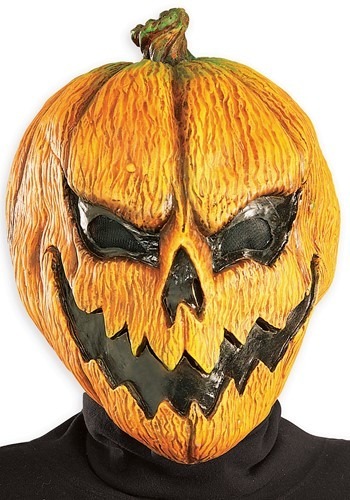 If you're looking for a way to integrate the cheery nature of autumn and the horrifying nature of Halloween then you'll want to invest in this mask. Pair it with a cloak that could be straight out of the story of Icobad Crane or a simple hoodie and jeans for a super spooky look. The vinyl mask has openings for the eyes so that you can clearly see the fearful faces of people as you jump out of pumpkin patches. No one will ever think pumpkins aren't scary again! Looks almost nothing like the image on the website. The actual product looks almost nothing like the image shown on the store website. Had I seen what it actually looks like, I would not have purchased it. It's very flat featured, misshaped, and the paint job also looks extremely rushed. It is also extremely hard to reshape after removing it from the plastic packaging.